You might think that living in South-East Asia, it just takes a hop, skip and a jump from one exotic locale to another. And usually this is true, if you are going from one well connected airport to another. However, you’d be surprised how long it takes to get from Hong Kong to the Philippines once you factor in airport transfers, taxis, bus rides, traffic, boat rides, rough seas and bad weather! 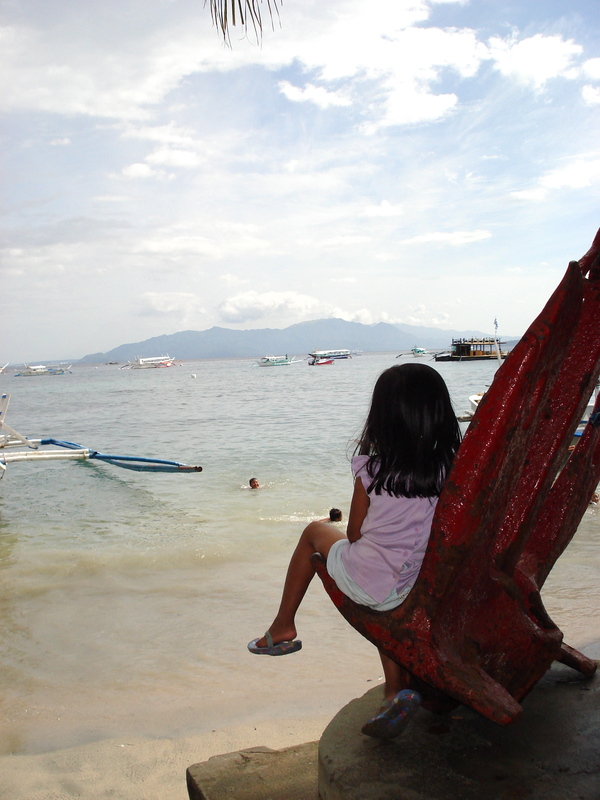 We were heading to Puerto Galera, on the island of Mindoro, just a few hours south of Manila. I would fly to Manila to meet fellow Travelling Trini Laura, and together we would get a driver to Batangas, and then a boat across the strait to Puerto Galera. This was my first time in Manila, and I can only describe it as insane, overcrowded, dirty, congested, and chaotic, with entirely too many people and too many cars and motorbikes and jeepneys. At one point, about ten highways and overpasses all intersected into one spot, with absolutely no traffic lights and no apparent right of way. But finally we got through, a few hours later Laura and I found each other, then the driver found us, and we were on our way. When we got to Batangas, we hopped onto a ‘banca’, a traditional Philippino boat, sort of like a pirogue but with these bamboo supports on the side. 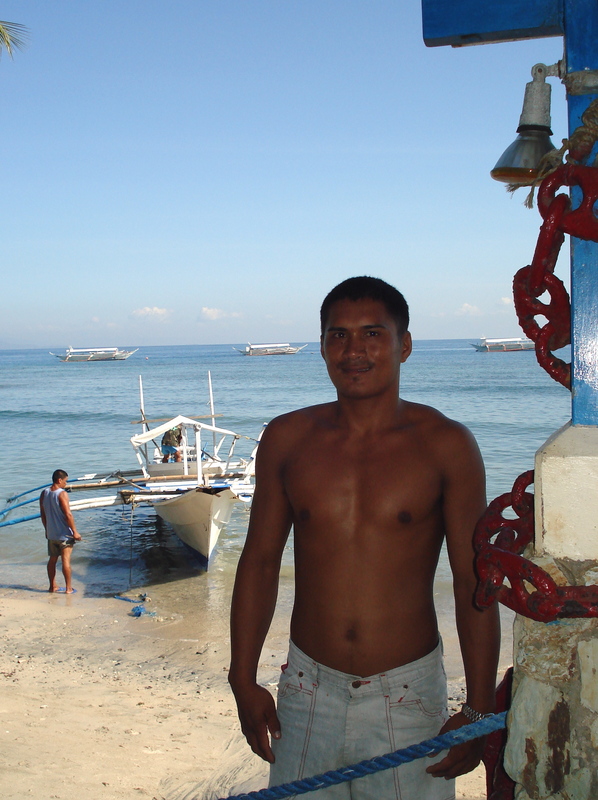 One of the boat boys, Jonas, chatted with us on the way, telling us about life in Puerto Galera. The ride was unbearably rough — even me with an iron stomach felt a bit seasick. The tides were changing, and the currents were strong. The banca pushed on, and we could see Mindoro in the distance, but it never seemed to get closer! Night was coming — I had been travelling for almost 12 hours… so much for the ease of travelling in Asia — and finally we entered Puerto Galera. It is a seaside town built along a narrow beach, with dive shops, bars and restaurants dotting the bay. We couldn’t see much at night, but we got to the guest house, dumped our bags, and headed our for dinner and drinks. It is low season right now, so not so many tourists, and almost all of them are divers, and predominantly men. Of course, two single young ladies got a bit of attention! 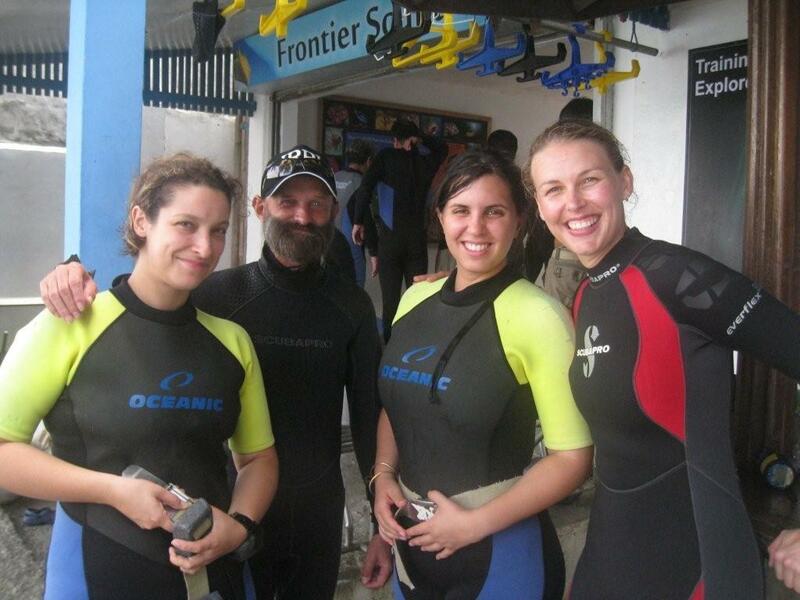 But we took it easy, and went to bed early, since bright and early in the morning we would start our diving adventure. At 8 am, we went down for breakfast at the restaurant attached to the dive shop. A very lanky white guy, maybe about 50, with the biggest, spikiest beard I’ve ever seen and eyes as blue as an ice floe in Norway came over to our table and introduced himself as ‘XC’, our dive master for the week. Originally from Germany, he had started spending a few months a year in the Philippines, and working the other months to pay for the diving. Then one day, he was offered a dive master job, and suddenly he didn’t need to go back to Germany. Over the next few days, we would meet many other foreigners like XC, who simply stopped going home, and settled in the Philippines. There was a group of Japanese tourists who were more advanced divers, and a couple from South Africa who turned out to also live in Hong Kong who were beginners, like me. We slipped on our wetsuits, got on the weight belts, and XC briefed us on our first dive. We went out to a nearby reef, and it was unreal how much variety of life there was. Visibility was excellent, up to 20 metres, and the colours! Pinks and purples and oranges and blues and yellows, small fish and big ones, nudibranches, turtles, clownfish, eels, just a sensory overload of marine life. Our second dive at a spot called the Manila Channel was even more impressive. We descended along a massive wall and through a channel with more colourful coral, again excellent visibility, and every imaginable creature. You almost didn’t know where to look — everything was so beautiful and bright and alive! Imagine that in 60 seconds, you can see more life than you would see on a 6-hour hike in the mountains. 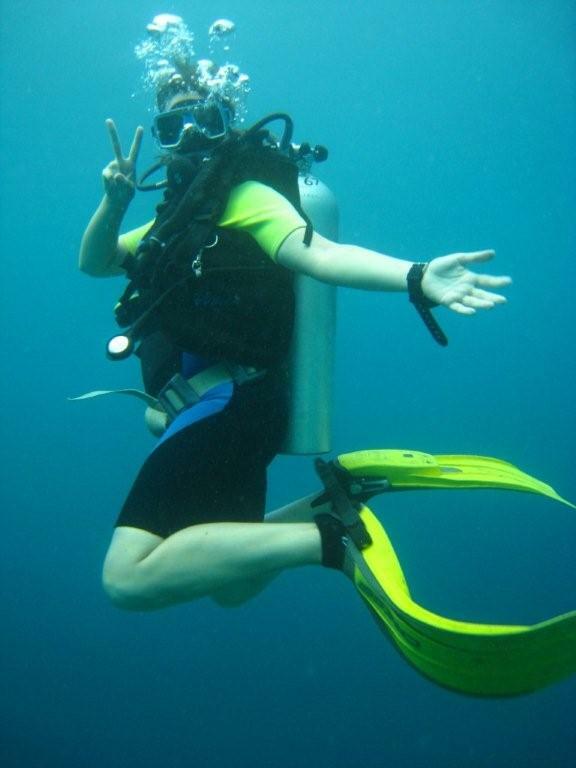 It truly made me wish that I had started diving ten years ago. After a quick lunch (yes, we did take breaks from diving! 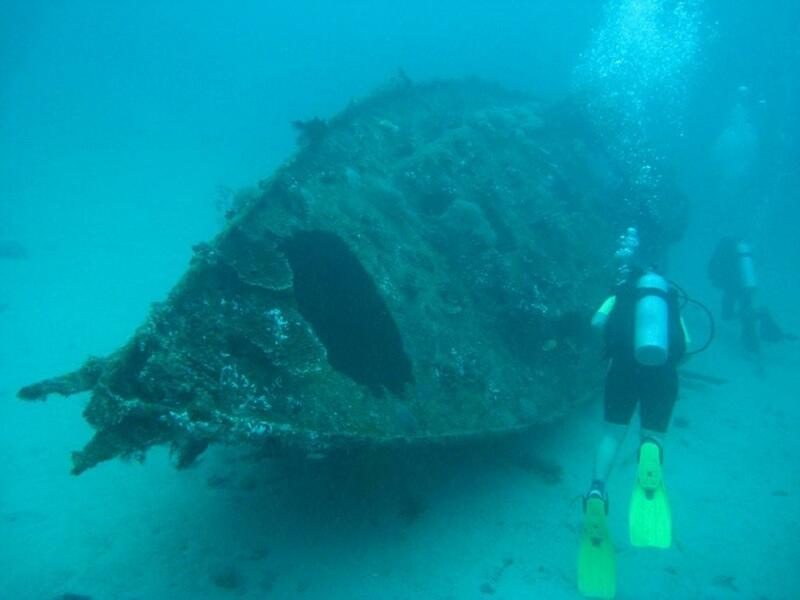 ), we hit our third dive, which was one of my favourites — the Shipwrecks. We dove around three sunken ships of different sizes and levels of decay, but it was fantastic. Around the ships were just sand, so the ships themselves had become a microcosm of life, with corals and all kinds of marine life, like a dense little city. 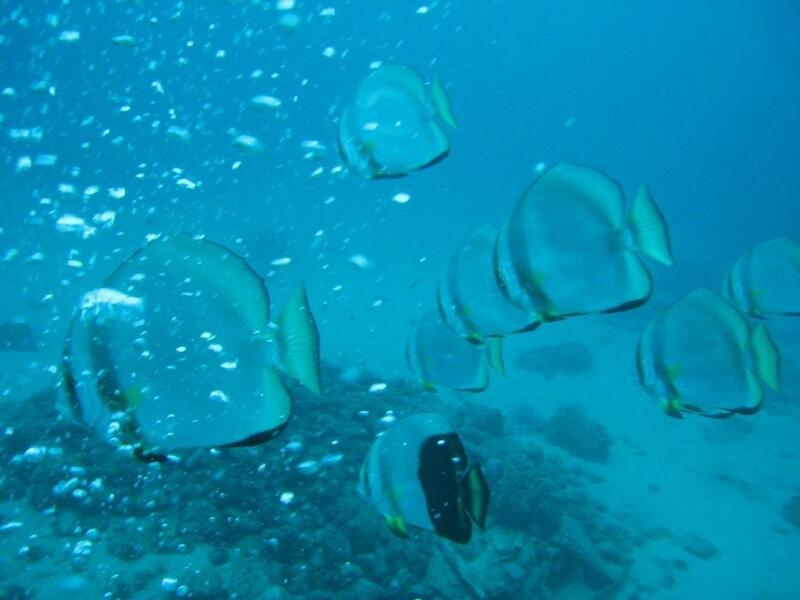 Huge groupers, eels, nudibranches, trumpet fish and angelfish were everywhere. One ship was big enough to swim through, but I wasn’t quite brave enough to do that yet. Dive two was slightly disappointing in terms of coral, but a gold star for strange creatures! 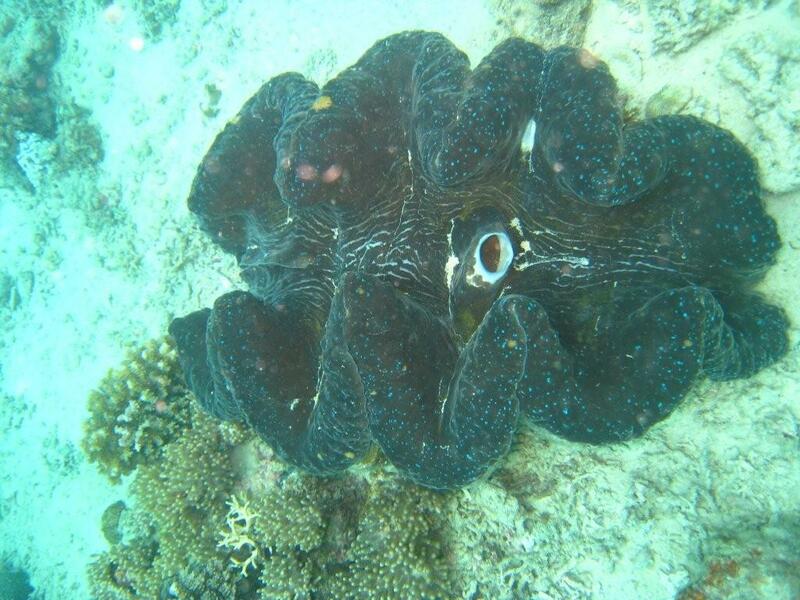 We went to see these giant clams, and I do mean giant, some as big as three or four feet long. We also came across a huge sting ray, as well as a very big eel which did not look happy about being disturbed. But without a doubt, the star of the day was the frog fish. XC was hovering over a big green rock next to a big piece of coral, and I was wondering what he was looking at. Suddenly I realised it was not a rock — it was an animal! I’ve never seen a frog fish before so I was amazed at how it has these sort of webbed hands that it sits on. XC tried to give it a little nudge, but it sort of just shooed him away with one of its ‘hands’ and resumed it’s lounging. Later XC told us that a frog fish is the laziest in the sea, sometimes sitting in the same spot for days at a time. Our last dive that day was at a spot called Escasion (spelling?). We dropped off the boat and descended about 20 metres where I landed right next to a beautiful big turtle, who was munching on some seaweed growing on a rock. It didn’t seem the least bit disturbed by our presence. We also came across a number of lovely dragon fish, which always reminded me of a Carnival costume. That night we went out for dinner with Jacque and CJ, the South Africans we had met, and had a very interesting conversation about South Africa and Trinidad and all of their apparent similarities. Even though Trinidad is so small, it has a lot of the same problems as Trinidad does, especially when it comes to crime and corruption. It’s not every day that you meet people who understand where you come from, so it was nice to meet people who knew exactly what Laura and I were talking about. The dive shop owner, Rick, was the bearer of bad news that morning. A typhoon was heading towards Puerto Galera, and that it was likely that the boats would not run tomorrow, which is when we were scheduled to leave. As much as I would have loved to get ‘stuck’ in paradise, we accepted the sad reality that we would have to leave a day early, and head to Manila to make sure we could catch our flight. We were quite disappointed, and wasn’t quite as bubbly as we usually were when we slipped on our wetsuits. But XC promised us a good last dive before we left. I was a bit apprehensive about diving to the Shark Caves, because I was worried about bad karma from all of the countless shark-and-bakes that I’d eaten on Maracas almost every Sunday of my life. Nonetheless, we descended, found the cave, and slowly, we all lay down on the ocean floor, and watched the white-tip swimming around the cave. Surprisingly, it wasn’t scary at all. In fact it is quite true, they are graceful creatures. It was with great sadness that we started going back up, and did our safety stop. I didn’t want to get out of the water at all. And the only thing on my mind as we broke the surface, was when can I dive again? Alas, there was little time to think about this, since we had to pack up our things and get ready to go before the storm hit. We were leaving on a banca, and heading back to crappy assed Manila. Going back to the city was awful. The bus dropped us off on a dark street in the middle of town where masses of people were swarming and pushing, where a group of men were eating rice with their hands off of a flattened cardboard box on the sidewalk. It was overwhelming and intimidating, two little white girls with backpacks in the city. We jumped in a taxi as soon as possible, and were dismayed to realise we had gotten into probably the only taxi in Manila where the driver didn’t speak English, and not only that but he also had no bottom teeth and bad eyesight because he couldn’t even see the map that we had in our hands to show him where the hotel was. Thankfully he knew one of the streets we called out, and he took us there to find the local YMCA to stay for the night. But when we got there, the YMCA hotel had been demolished! A man who worked at the YMCA office came outside laughing at our situation, and then jumped in the taxi with us to take us to another nearby hotel. I have to say, the Philippino people are truly friendly, kind and easy going people. He really went out of his way to help us, bless him. That night we took a shower, lay down, and instantly fell asleep. My flight out of Manila — which Laura had by now nicknamed ‘The @$$hole of Asia’ — was not until 7 pm, which meant we had some time to kill. So we went to a nearby mall where I decided to get a pedicure. The women in the spa were amazed at my hard goat feet. ‘Ohhhh very very hard ya? Why your feet so hard? Hey Anna! Come here! Come see these feet! Kya kya kya!’ They did a damn good job and I came out with fresh baby feet. I gave her a very generous tip, since it took her almost two hours for the spa and it only cost US $5. That day in Manila, many people talked to us and asked us where we were from. They all told us how they were trying to leave the Philippines, and go to live in Canada. One even said he was applying to go to Saskatchewan because he could make in one hour what he makes in one day’s work. Imagine they are willing to move somewhere that is -30’C in the winter in order to make more money and have some kind of a better life. The Philippines is developing, but seems to be developing slowly and people are struggling to get ahead in life. It made me realise how fortunate I am to be able to take trips, to go diving, to travel and go sightseeing. That kind of lifestyle is something most Philippinos can only dream about. Sigh. All good things must come to an end. Vacations are very good things which makes them particularly difficult to leave. I could barely will my feet to keep walking to the office on Thursday and sit down under those fluorescent lights and do some work! But what’s keeping me going is the fact that I still have four days of annual leave to use. And you know what that means! Philippines…. AH COMIN’ BACK SOON! I highly recommend that travelers avoid Manila and Cebu City at all costs!! But my experiences outside of the city were fantastic. I really found the locals to be welcoming and friendly. I had a great time Em… we MUST do it again! the drink ting is true i live in sabang beach and if you order the drinks they go on your bill, maybe someone should have told you. thank you for visiting puerto.. 🙂 mind if i use a pic o you with XC.. going to use it on a page.